The Audio meters let you see and track the audio levels of clips in Final Cut Pro and warn you if a particular clip or section of a clip reaches peak levels, which may result in audible distortion. The number of audio meters you see depends on how many channels are configured for the clip you’re playing. For example, when you play back a surround clip in the Browser, six surround audio meters are displayed, but if you drag that same clip into a stereo project in the Timeline, Final Cut Pro automatically mixes down the surround audio into stereo, and only two audio meters are displayed. For more information, see Configure audio channels. When an audio clip is approaching peak levels during playback, the level color changes from green to yellow. 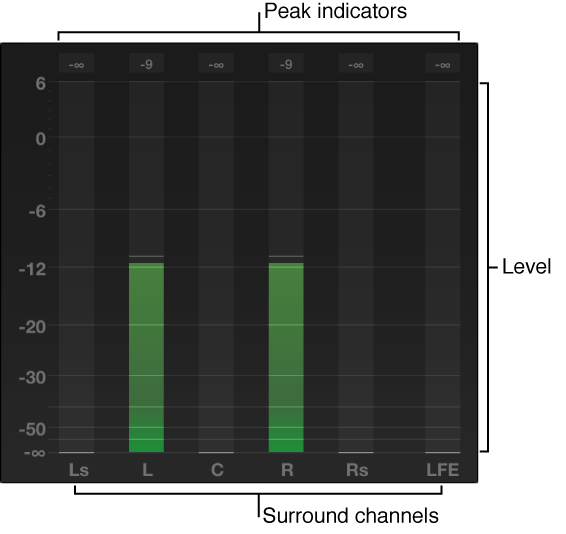 When an audio clip exceeds peak levels, the level color changes from yellow to red, and the peak indicator lights red for the respective audio channel or channels. The peak indicators reset when you stop and start playback again. To avoid having clip volume exceed peak levels, adjust the volume. Although the proper level for a clip depends upon the overall mix you want, it’s important to make sure that the combined level for all concurrent clips does not exceed 0 dB during the loudest sections. Final Cut Pro includes two meters, a small Audio Meter icon in the Dashboard in the toolbar and a larger Audio Meters pane. Choose Window > Show Audio Meters. Click the Audio Meter icon in the Dashboard in the toolbar. You can drag the edges of the meters to see an expanded view with additional information. To hide the Audio meters, choose Window > Hide Audio Meters, or click the Audio Meter icon in the Dashboard in the toolbar. Select the clip in the Timeline, readjust the level, and play back the clip again to test for peaks. In the Timeline and Browser, the waveform section or sections of a clip turn yellow when a level is approaching peak levels and red when a level exceeds 0 dB. What is Final Cut Pro?